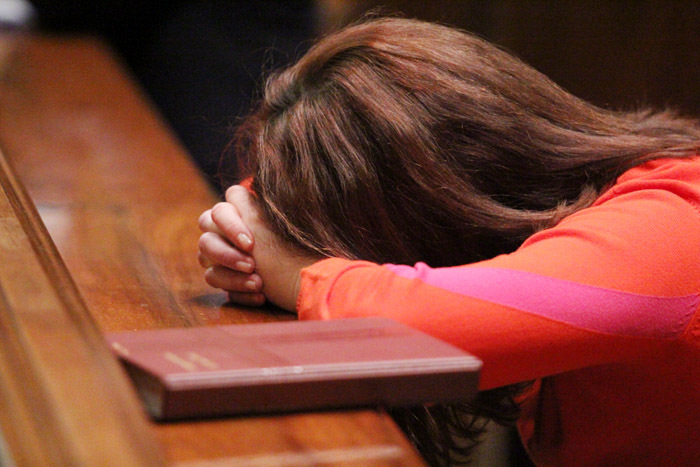 Megan Rath from the Cathedral prays during Mass. Lent is the traditional season for reflection and repentance for past sins as the faithful prepare for the Easter celebration of redemption, and by extension by the church itself, as needed. 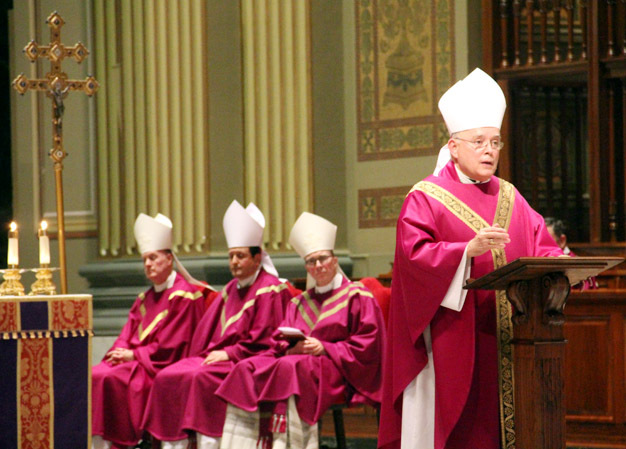 Archbishop Charles J. Chaput was the principal celebrant of a Mass for healing for victims of clergy sexual abuse Saturday evening, March 22, at Philadelphia’s Cathedral Basilica of SS. Peter and Paul. The readings for the Third Sunday in Lent were perfect for the occasion, especially the Gospel account of the spiritual healing by Jesus of the Samaritan woman at the well. A number of those sinned against — survivors of clergy sexual abuse and their family members — were in the congregation of 200 or so, as well as a knot of orderly protesters outside the cathedral who were witnesses to the continued need for justice and healing. 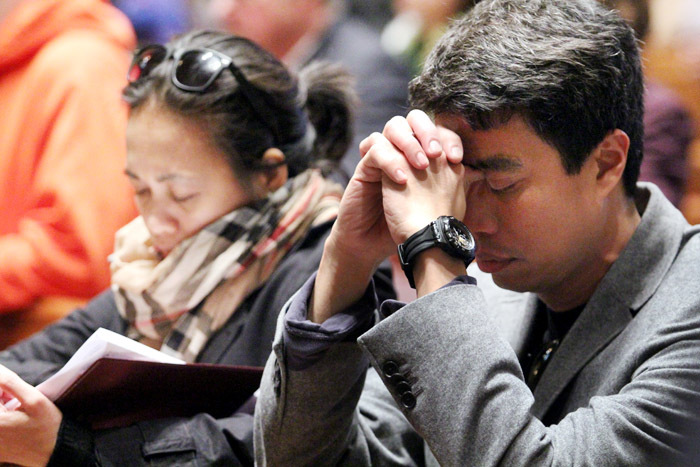 A mea culpa on behalf of the Archdiocese of Philadelphia was issued by the archbishop during his homily. Archbishop Charles Chaput preaches the homily. He also addressed the issue of the inaction by church authorities, to whom clergy sexual abuse was reported. 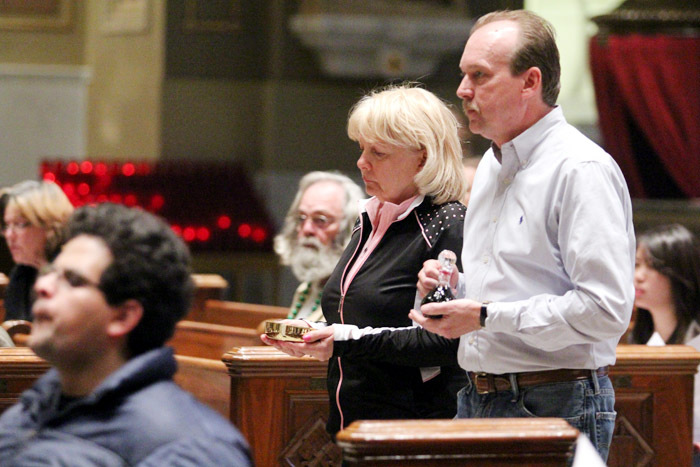 The idea for the Mass came out of the archdiocesan Office for Child and Youth Protection several months ago, according to Kenneth Gavin, director of the archdiocesan Office of Communications. “It made logical sense for the Office for Child and Youth Protection to work with the Office for the Clergy to arrange the Mass. The hope is to assist the victims on the path to spiritual healing,” he said. Geri and Bob McGuckin from Visitation B.V.M. Parish in Trooper bring up the offertory gifts. Leslie Davila, who is director of the archdiocesan Office for Child and Youth Protection, was pleased that everyone who wished to participate in the Mass had an opportunity to do so. Her office continues to work with victims to identify ways the archdiocese can be of assistance to them. 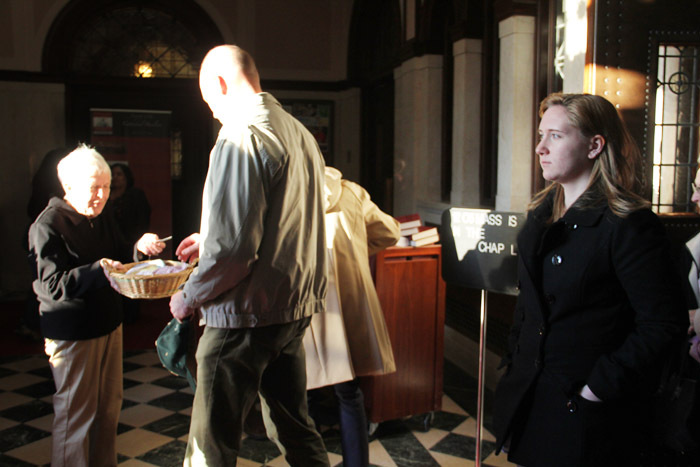 Some who attended the Mass were there simply out of sympathy for victims of abuse. Among them was a group of ladies representing senior citizen groups connected with the archdiocese. They were handing out prayer cards and small knitted squares made from various colors of yarn. Volunteer Mary Raksnis from St. Katharine Parish in Philadelphia hands out knitted prayer squares after Mass. Barbara Ann Fields was one of the parishioners of Cathedral Parish who came to the Mass, and she thought the archbishop’s homily was appropriate. Bravo to Archbishop Chaput for saying this very painful but very necessary Mass.